The Husky is a unique breed in that they almost never bark. Instead, they prefer to vocalize through howling or howling noises which many like to label as “talking.” It is normal for a Husky to howl just as it is normal for other dogs to bark. However, when your Husky is howling excessively and your neighbours begin to complain, that is when Husky howling becomes a problem. Huskies howl when they are lonely or when they are not getting enough exercise and need to release some energy. They are very pack oriented and do not enjoy being alone for long periods of time. They were also bred to be very high energy and thusly, require lots and lots of exercise. 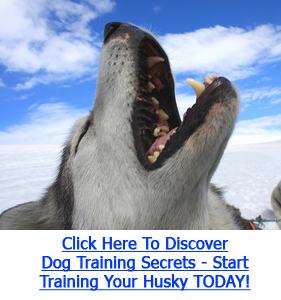 Insufficient exercise is one of the main causes of excessive Husky howling. It cannot be stressed how important exercise is for this breed. In most cases, they howl to use up their pent up energy. However, with these dogs, a light walk will not be enough to fulfill their exercise requirements. They were bred to run for miles and miles each day. A nice jog or a brisk walk is more suitable as an exercise for Huskies. Whenever you have free time, take your Husky out for a walk. Even 30 minutes at a time will be highly beneficial towards curbing the problem. Try to take him for at least two walks per day. You will instantly see improvement in his behaviour if you increase the amount of exercise he’s getting. If providing more exercise is not solving your Husky howling problem, then using a crate is highly recommended if you aren’t already using one. The most important factor here is to use the crate properly. You always want your Husky to associate his crate with positivity. Let him take his time in getting used to it and never try to force him into going in his crate. Never use the crate as a form of punishment. Any negative associations with his crate may prevent him from ever fully accepting it. At first, only confine him for a short period of time. Then gradually increase the amount of time that he is confined. At first, he may howl, but this will stop once he’s become accustomed to his crate. Do not let him out of his crate if you know he is howling for attention, as doing so will make the problem worse. In some cases, Huskies howl from separation anxiety. Since they are very pack-oriented, they will always want to have company. If your Husky has separation anxiety, consider getting a second dog if possible. The only catch is that you have to make sure that your Husky does get along with the second dog. However, if they do get along, your Husky will be much less likely to become bored during the day when you can’t provide him with attention and it will also greatly help with his separation anxiety.